The 6.8-mile rail line between the City of Arcata and the hamlet of Korbel winds along the scenic Mad River through small historic communities, riparian forests and agricultural lands. The Arcata and Mad River Railroad — reportedly the first functional railroad in the west — is the end of the line for the Northwestern Pacific Railroad between the San Francisco bay area and Humboldt County. Affectionately called the “Annie & Mary” for two secretaries who worked at either end of the line, this rail line has been out-of-service since the early 1990s and has little potential for supporting trains in the near future. Majestic redwood trestles still exist along the corridor, as does a rail yard with historic engines and logging equipment. The corridor bisects the small historic city of Blue Lake, complete with a station-turned-museum and an internationally renowned school of physical theater. Community members have a vision of preserving this historic corridor as a multiple-use trail for recreation and transportation. The rails and ties were removed in late 1997 for salvage, the corridor is overgrown, structures and drainages are in extreme disrepair, and a number of adjacent landowners claim that they own the corridor instead of the North Coast Railroad Authority. With these and many other problems facing the longevity of the corridor, preservation of the route as a trail makes the most sense for the community. Currently, 11,300 miles of railroad corridors across the country have been preserved as trails, and another 19,000 miles of rail-trails are in the planning stages. Though resources are scarce in this rural region, so are opportunities to safely hop on a bike or horse, or walk without reliance on a car. As a trail, the proposed route will connect the communities of Arcata, Glendale, Blue Lake and Korbel, and a segment of the California (Hammond) Coastal Trail via one mile of bike lanes. The proposed Annie & Mary Rail-Trail will be an asset to locals and visitors alike. In 1997, the Executive Director of the NCRA contacted Natural Resources Services (NRS) to initiate collaboration on a rails-with-trails project along the Annie and Mary Rail line. 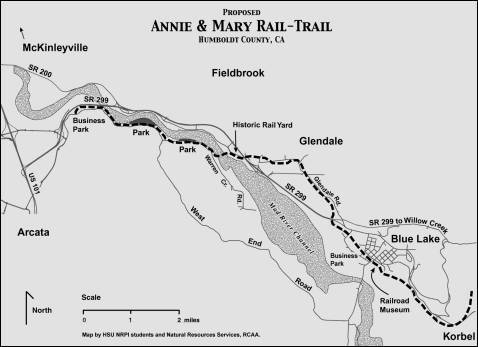 Following several trail-related community meetings in Blue Lake, the Friends of the Annie & Mary Rail-Trail was formed. NRS worked with this group to conduct a preliminary assessment on the rail-trail project before full funding of $160,000 was secured from the California Coastal Conservancy to conduct a feasibility analysis of the entire route. Now complete, the Annie & Mary Rail Trail Feasibility Study lays out a number of options for development of a high-quality, multiple-use trail that would enable future public access for non-motorized recreation and transportation on the A&M corridor and explores realistic methods of keeping the historic Annie & Mary corridor intact. As the organization responsible for coordinating the entire, NRS worked with a number of agencies, contractors, and community groups in completing the Annie & Mary feasibility study. NRS held a number of public forums; created and distributed surveys; and communicated with landowners, community members, and other interested stakeholders on an ongoing basis.